Simone Pero at the New York Women in Film & Television Muse Awards ceremony in 2017. Simone Pero could not possibly have chosen a more appropriate name for her strategic marketing and production firm specializing in the confluence of content and social action: For Impact Productions. 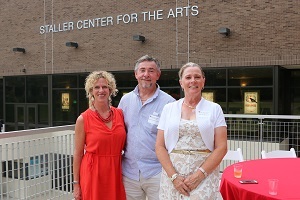 Continuing to serve as visiting faculty, Pero, a Stony Brook alumna, was part of the original leadership team—along with Artistic Director Christine Vachon of Killer Films, Program Director Magdalene Brandeis, and Associate Provost Robert Reeves—responsible for creating what has evolved to become the Stony Brook MFA in Film with tracks in Directing, Screenwriting, TV Writing, and Producing, along with an Independent track. 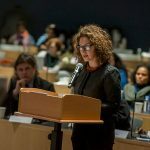 Named the president of the board of directors of New York Women in Film and Television (NYWIFT) in July 2017, Pero testified in December 2017 about sexual harassment in the workplace before the New York City Human Rights Commission, the Commission’s first public hearing on sexual harassment in more than 40 years. 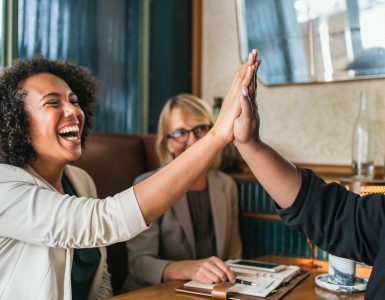 On May 9, 2018, Mayor Bill de Blasio signed the Stop Sexual Harassment in NYC Act, a comprehensive legislative package aimed at addressing and preventing sexual harassment in the workplace. 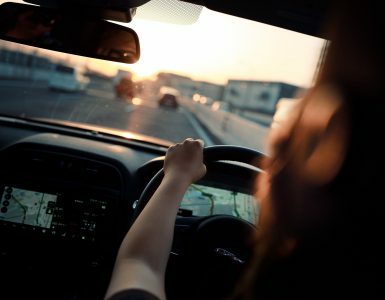 The package includes an expansion of the City Human Rights Law in cases of gender-based harassment to increase the statute of limitations from one year to three years and expand protections to all employees, regardless of the size of their employer. 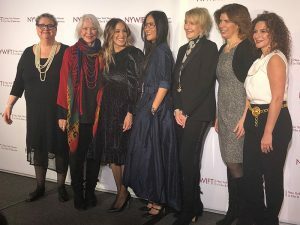 Terry Lawler, Ellen Burstyn, Sarah Jessica Parker, Lisa Nishimura, Tricia Brock, Julie Menin, and Simone Pero at the NYWIFT Muse Awards ceremony December 13, 2018. Featured artists weighing in on the issue in the film include Meryl Streep, Gillian Anderson, Mary Louise Parker, Taraji P. Henson, Marisa Tomei, Geena Davis, Zoe Saldana, Rosario Dawson, Natalie Portman, and Cate Blanchett, to name only a few. On January 17, 2019, Deadline Hollywood announced that theatrical, streaming and broadcast rights for North America for “This Changes Everything” had been acquired by Good Deed Entertainment and the film would be released theatrically in the first half of 2019. Switching focus to global impact, few if any films can match the kind of far-reaching raising of awareness and call to action achieved by “The Tale,” another film on which Pero served as a producer, and much more. 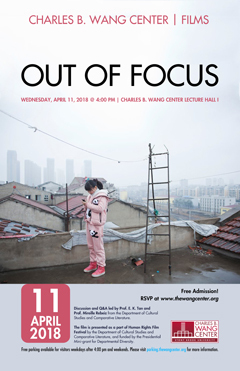 In this film, her first scripted feature, longtime award-winning documentary director Jennifer Fox presents an autobiographical recounting of child sexual abuse while exploring the way trauma can shape an individual’s memory into a self-protective shroud over the experience. Acceptance into the 2018 Sundance Festival “forever changed the trajectory and possibilities for this film and our social impact mission,” Pero wrote. Four months after HBO, in an unprecedented move, picked up the distribution rights, the film was on the air worldwide and has now been shown in 200 countries. The film has been screened, and won honors, at myriad festivals globally, and been nominated for prestigious awards, including from the Golden Globes, Emmys, Film Independent Spirits, Critics Choice, and Gothams, among others. HBO has supported all outreach efforts to allow free screenings with organizations, professional conferences, schools and universities, using the film to expand and deepen the conversations around understanding, preventing, and ending child sexual abuse. 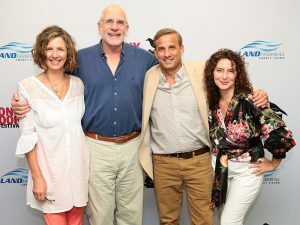 Magdalene Brandeis, Robert Reeves, Alan Inkles and Simone Pero at the Stony Brook Film Festival in July 2018. In the weeks and months since the film’s first screenings, Pero and Fox’s outreach work has made profound inroads in progress on the ground and at the top level in the field of child sexual abuse. For example, the first week of October last year began with the film and filmmakers as featured participants in the launch of The Economist’s Intelligence Unit’s Benchmarking Index on Child Sexual Abuse and Exploitation at the United Nations, hosted by the World Childhood Foundation and HM Queen Silvia of Sweden. At the UN on October 3, 2018, Fox not only presented “The Tale” and her story as a survivor and filmmaker but also laid out the case for how fiction film can be a tool to change the world. 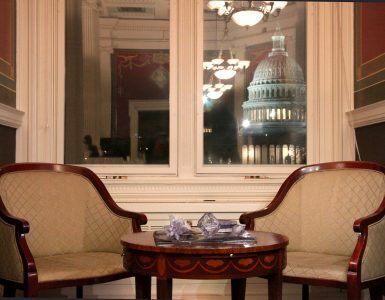 She implored global policymakers and advocates to move beyond the intellectual, statistical, and nuts and bolts of resolutions and law-making and consider emotional trauma in order to gain understanding and perspective as they approach their work around the world. In addition to the Queen and Princess of Sweden, those in attendance included the Deputy Secretary General of the United Nations Amina Mohammed; the Swedish Ambassador to the UN, H.E. Olof Skoog; and a host of high level global experts focused on ending child sexual abuse and exploitation. Two days later, Fox and Pero joined an esteemed braintrust meeting to explore ways “to shift our culture around CSA, particularly during this pivotal moment in global history.” The gathering, inspired by “The Tale”—its articulation of CSA, and its reach into mainstream culture—was co-designed by Pero, who brought to the table a range of issue experts, social movement builders, and advertising and marketing executives for the kind of rare multi-disciplinary approach that is vitally important in the effort to unearth new ideas and solutions. As Pero said after the session, “It was clear that not only is ending CSA a societal issue, it is a moral, economic, and humanitarian imperative.” Today, five months later, as a result of that first meeting, a working coalition has been formed with organizations like the Child Safety Pledge and Darkness to Light to move the needle forward toward education and prevention. Since the start of 2019, Pero has been tapped to advise on high-profile, social issue-oriented film and television content projects. She is also continuing to appear on behalf of “The Tale,” most recently at the Atlanta Jewish Film Festival. 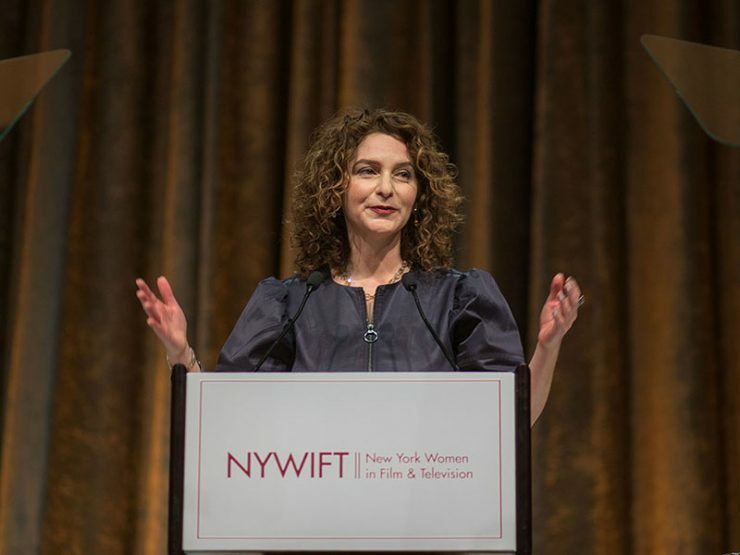 She will also be doing the Q&A for the opening night screening of “This Changes Everything” at the Women’s Film Festival in Philadelphia and for the film’s screening on NYWIFT’s Support Women Artists Now (SWAN) Day on March 30, 2019 at the SVA Theatre in Manhattan. On March 9, 2019, Pero presented a workshop in Nova Scotia at WIFT-Atlantic’s Women Making Waves Conference exploring the latest tools, trends and best practices when developing and approaching a social action impact campaign for documentary and narrative projects.